Stephen Harper says the Conservatives have taken steps to address the current economic turmoil, but refuses to be pressured into changing their stay-the-course path. In a 30-minute interview with CBC's Peter Mansbridge, Stephen Harper spoke about Afghanistan, Canada's economic situation and controversy over his remark that the arts are a niche issue. 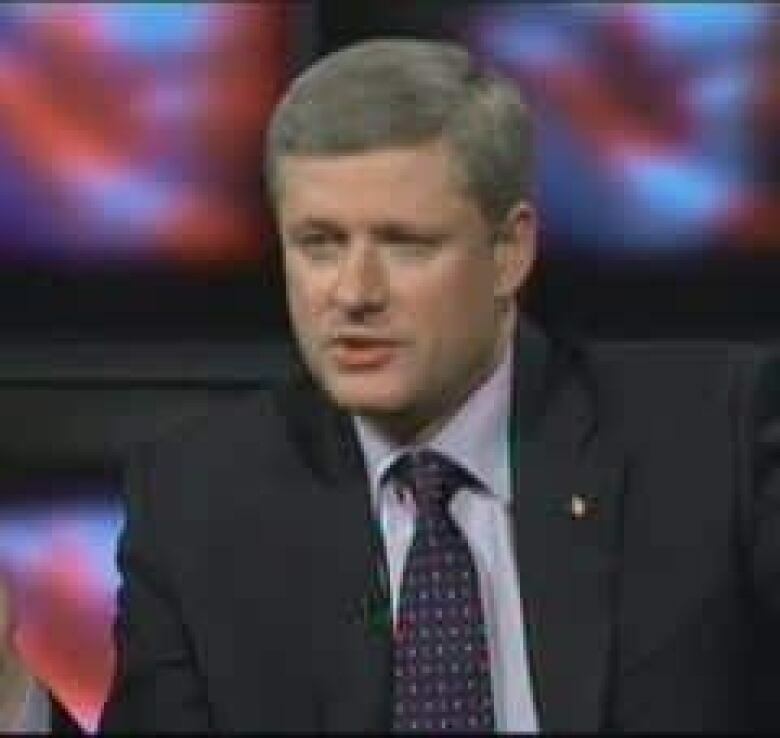 ((CBC))In a one-on-one interview Tuesday afternoon with CBC's Peter Mansbridge, Harper accused the opposition parties of wanting him to "radically increase the size of the budget and increase taxes." "This prime minister isn't going to panic and he isn't going to be pressured into doing something stupid just for the sake of proving that we're doing something." The Conservative leader stressed that Canada is not in the same financial straits as other countries. "What most of the leaders around the world are dealing with right now are not drops in the stock market," the Conservative leader said. "Everybody has a drop in the stock market right now," he said. "Most of them are dealing with fundamental instability in their banking system, which we are not." Harper said his government has been aware of the fiscal difficulties ahead since August 2007 and has been putting a plan in place to deal with it — keeping budgets balanced, getting taxes down and making sure the government spends money in a way that creates jobs of the future. His interview came hours after he released the party's platform under growing pressure from political rivals. The 41-page document outlines many of the proposals already announced by the Conservatives, but includes new promises, including $400 million more in loans over the next four years to help the manufacturing sector in Central Canada. In the interview, Harper stressed that the government is investing in job training to "make sure that as we lose jobs, we're creating jobs." The Conservatives have pledged $200 million to the Automotive Innovation Fund and another $200 million to the Strategic Aerospace Defence Initiative. "Notwithstanding the problems, we're on the right track," stressed Harper. "What the opposition is demanding I do — raise taxes, increase spending, do a lot of direct intervention and bailouts — these things would demonstrably ruin our fiscal credentials and undermine the strengths that we do have in our economy relative to a lot of other countries." Harper said he identified with the fears Canadians feel as the stock markets continue their plummet amid worldwide turmoil, saying his mother, who is retired, has been watching her portfolio hour by hour. The prime minister, however, said he hasn't checked on his mutual fund portfolio since he was elected. "I would dread to look at it right now," Harper admitted. Harper noted that the Bank of Canada last week introduced additional liquidity measures, and hinted there will be additional action in the next few days to deal with the credit crunch in some Canadian financial institutions. He wouldn't give details. "I know the bank will make sure that interest rates stay as low as possible while making sure we don't run into an inflation spiral in this country." Harper stressed the importance of maintaining stable inflation but added that Canada stands out from the pack because its inflation is "relatively contained." He said Canada's central bank, the Department of Finance and Office of the Superintendent of Financial Institutions began holding regular meetings about co-ordinating their response to the turmoil prior to the Sept. 7 election call. The Conservative leader also suggested that "good buying opportunities are opening up" in the midst of stock market downturns, saying some stocks have hit bottom. Mansbridge questioned Harper on a range of topics, including his reaction to widely circulated comments by Britain's senior commander in Afghanistan that the battle against insurgents is not winnable for Western forces. Brig.-Gen. Mark Carleton-Smith told a London newspaper that an absolute military victory is impossible and striking a deal with the Taliban should be considered a strategic option. Harper, who once declared Canada would never cut and run, said a nearly decade-long mission does not constitute running and said he stands by the firm 2011 withdrawal as a wise decision. "I don't believe that we can pacify every corner of Afghanistan as foreign troops. What we can do is establish some basic security and train the Afghan security forces to gradually accept responsibility for the day-to-day security of their country." If there were no timeline in place, he suggested Afghanistan would never manage its own security. Mansbridge also asked Harper about whether he regretted dismissively calling arts a niche issue in response to criticism about his government's $45 million cuts to arts and culture funding. In late September, Harper said: "I think when ordinary working people come home, turn on the TV and see … a bunch of people … at a rich gala all subsidized by taxpayers claiming their subsidies aren't high enough when they know those subsidies have actually gone up, I'm not sure that's something that resonates with ordinary people." On Monday, Harper said the remark was torqued by the media and stressed his central message was that the government is responsible for managing taxpayers funds. Under the Conservatives, he reiterated, the government has increased arts spending by eight per cent but cut programs that weren't giving "bang for the buck." With opinion polls putting the Conservatives in minority territory, Mansbridge asked what the party could accomplish if it doesn't secure a majority. Harper responded that two minorities in a row have a "stronger mandate than one minority" and seemed unconcerned by the possibility of another snap election since opposition parties would likely be scrambling to reorganize after a loss. Mansbridge is interviewing four of the federal leaders and has already spoken with the NDP's Jack Layton and Green Leader Elizabeth May. Readers who want to ask Stéphane Dion a question can send it tonational@cbc.cafor The National's Your Turn with the Liberal leader on Oct. 8.